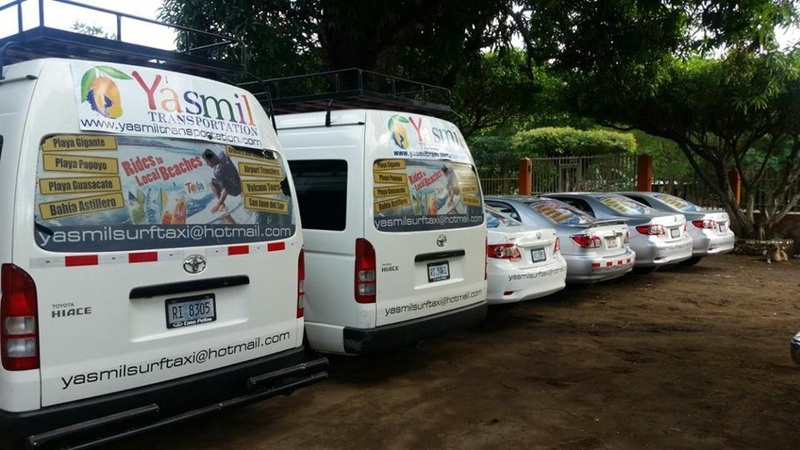 Yasmil Transportation is a family owned private taxi transportation company offering rides anywhere in Nicaragua. Yasmil mostly serves the Popoyo, Rancho Santana and Hacienda Iguana areas. The fleet of cars include fuel efficient passenger sedans and 10 person vans for groups & families. It's best to book a ride before your arrive and have Yasmil or one of his professional drivers pick you up at the airport. Enjoy a comfortable ride with A/C and complementary ice cold water. 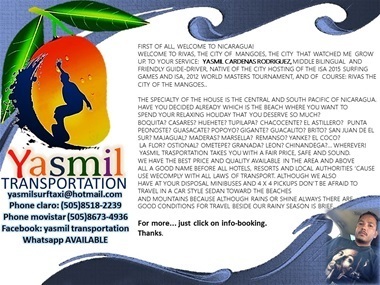 If you need to get around, Yasmil can take you on day trips, grocery runs or rides to other destinations in Nicaragua. ​Yes.. Surfboards are included in the price. If you are traveling alone your boards can fit inside the sedan through the trunk and backseat or if you are traveling with friends he has Da Kine surf racks for boards on top. Please note: You must carry your passport for travel anywhere in Nicaragua! Getting to Popoyo is easy with Yasmil Transportation. Offering safe private car service, reliable transportation in and around Popoyo Nicaragua including service to and from Managua. Yasmil is the "Man" if you need a ride from or to the airport or just about anywhere. His fleet of vehicles are outfitted with A/C which will make sure you arrive in comfort. Yasmil is fluent in Spanish and English and knows Nicaragua better than anybody. Sit back, relax, enjoy a complemetary bottle of water and a cold Toña Beer while you see the sights of Nicaragua during your drive. Our taxi's have DaKine soft surfboard racks to safely carry your surfboard travel bags.